Thanksgiving is a time for food, family, and arguing politics with people you’ve blocked on social media but can’t avoid at the dinner table. 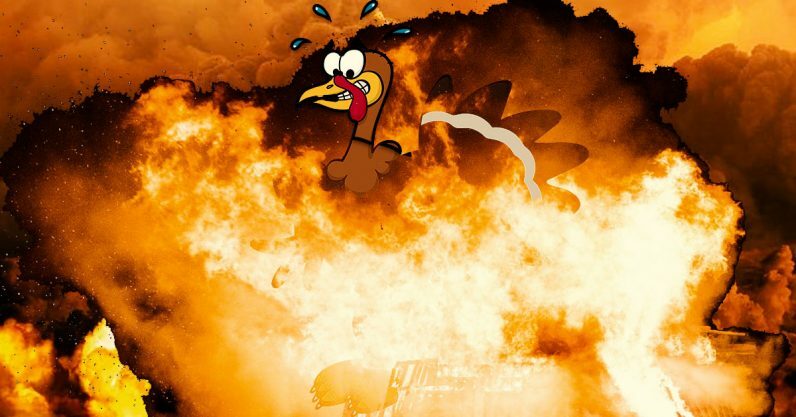 This year, if things get too tense, we’ve got a suggestion: break out the turkey fails. There are few things that can bring people together during the holidays like a YouTube video that makes everyone, even the family members who voted the wrong way, feel superior. And, on Thanksgiving, that means watching people who lack a bare-minimum understanding of physics try and fry a turkey. First off, it’s apparent that a large portion of the turkey-loving population doesn’t understand liquid displacement. And that means they’ve probably never taken a bath. If they had, they’d know that if you fill a container to the top with liquid, and then add a solid, the liquid will be displaced and overflow. Another concept that seems difficult for some to grasp: you should never immerse a frozen turkey in boiling oil. Sure, it sounds like a great way to coax a confession from it, but in reality it’s an explosive way to demonstrate that thermodynamic systems will always try to achieve equilibrium. Perhaps not everyone understands the laws of thermodynamics, but you shouldn’t have to tell people not to heat up large quantities of oil over an open flame next to structures made of wood. Right? Be safe, respect physics, and have a great holiday!